Life is not about what you are. It’s about what you can be. And with the right fuel, B-UP believes you can unlock your unlimited potential. That’s why we go where no bar has gone before, blending the highest quality nutrients with select mouth-watering ingredients to deliver advanced nutrition that simply tastes better. It’s time to be active. It’s time to be healthy. It’s time to be better. But above all, it’s time to B-UP. 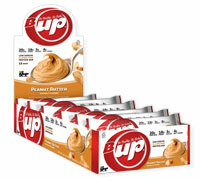 Each B-UP Bar is packed with 20g protein and 18-20g fiber, with only 2-3g of sugar and 4-6g of net carbs.Â They come in 6 delicious flavors… Peanut Butter, Vanilla Peanut Butter, PB&J, Sugar Cookie, Cinnamon Roll, and Chocolate Mint.Â Made with no artificial flavors, sweeteners, or preservatives, B-UP bars are low sodium and gluten free. We go where no bar has gone before, blending the highest quality nutrients with select mouth-watering ingredients to deliver advanced nutrition that simply tastes better. We use only the highest quality whey and milk protein isolates for their unique ability to create a softer creamier texture and one of a kind multi-dimensional flavor experience.Â We use real and natural ingredients and sweeteners such as stevia and monk fruit to deliver delicious, nutritious snacks for your healthy lifestyle. Did we say low sodium? Yes, B-UP bars are low in sodium.Â We take the guilt out of eating a bar by giving you the quality protein and fiber you need without the extra sodium.Â Compare that to the bar you currently eat and see for yourself why B-UP Bar is becoming preferred choice of so many consumers. Whether you are watching what you eat, needing a healthier snack, or incorporating more protein into your diet, B-Up Bars are the perfect tasty bar for you. NutritionÂ minded active individuals have long appreciated the health benefits of dietary fiber. We use 100% natural prebiotic vegetable fibers from isomalto-oligosaccharide (IMO). Prebiotic fibers provide valuable nutritional support for optimal digestive health, which is fundamental to healthy immune function*. Lean muscle holds the key to physical performance, and maintaining a healthy metabolic rate. To optimize that potential we use only proteins from Whey and Milk Isolate. Whey protein isolate is a fast acting protein, and when combined with slower release Milk protein isolate they deliver what exercise scientists regard as the most powerful and efficient way to nourish lean muscle. A delicious source of health promoting monounsaturated and polyunsaturated fats, almonds have proven to be one of natures true nutritional marvels. Cocoa butter is obtained from whole natural cocoa beans, which are fermented, roasted, and then separated from their hulls. Cocoa butter contains a high proportion of stable fatty acids that provide excellent mouth feel and texture, are resistant to the harmful effects of oxidation, and have no more than trace amounts of caffeine. We’ve all experienced, maybe even craved, the distinct, rich flavor that comes from real chocolate. But, you may not know that due to high levels of antioxidant flavonoids, and stable fatty acids, in moderation chocolate can also provide health benefits. Xylitol is a delicious sugar substitute that has been used by diabetics and non-diabetics alike. Unlike other sugar substitutes, Xylitol is not an artificial substance, but is widely distributed throughout nature in small amounts. Stevia is a sweetener and sugar substitute made from the leaves of the plant Stevia rebaudiana. Stevia contains steviol glycoside extracts that are up to 300 times the sweetness of sugar, putting it in high demand for low-carbohydrate, low-sugar sweeteners. Because stevia has a negligible effect on blood glucose it is attractive to people on carbohydrate-controlled diets. A fruit derived from a plant, monk fruit extract extract is nearly 300 times sweeter than sugar and has been used in China as a natural low-calorie sweetener for cooling drinks, and in traditional Chinese medicine to treat diabetes and obesity. *NOTE: Nutritional information and ingredients may vary from flavour to flavour.